GREEN BAY, Wis. (AP) - After 14 long years of frustration, Green Bay Packers fans raised their arms to the night sky Sunday and howled in victory as their beloved team won the Super Bowl. Thousands took to the streets of the NFL's smallest city moments after quarterback Aaron Rodgers took a knee to seal the Packers' 31-25 victory over the Pittsburgh Steelers, screaming, honking their horns and high-fiving and hugging complete strangers. Eighteen-year-old Stephanie Griep raced through the crowd with a Packer flag. She wore tights, gloves, shoes, a Packer cap, a Packer bra and nothing else in the sub-freezing temperatures. But it didn't matter. Nothing did on this night. "The Packers won, so I've got to do everything," she said. "Go big or go home. They won so I got to go big." The entire state of Wisconsin had been bursting with anticipation since Green Bay defeated its archrival, the Chicago Bears, two weeks ago to earn its first berth in the title game since 1998. But here in the Packers' hometown, a blue-collar, industrial city of about 100,000 people slogging through another bleak northern winter, the excitement approached frenzy-like levels. On Sunday, Packer banners hung from almost every other front door. A giant sign on the roof of St. Vincent Hospital proclaimed the facility loves the Packers. People used green-and-gold spray paint to decorate snow drifts with "Go Pack Go!" Everyone on the streets was decked out in Packer gear. Green Bay lost the 1998 game to the Denver Broncos, a year after beating the New England Patriots in the Super Bowl. Sunday's game itself was a roller coaster. Each time Green Bay looked on the verge of pulling away, the Steelers came roaring back until the Packers forced Pittsburgh to turn the ball over on downs on its last possession. 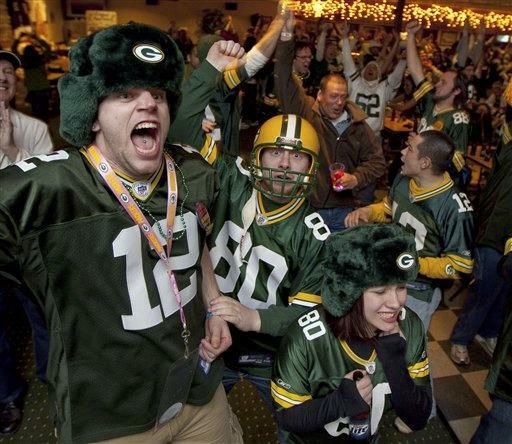 Fans who gathered to watch the game at Titletown Brewery lived and died with every play, alternating between burying their faces in their hands and leaping to their feet and fist-pumping. After Green Bay stopped the Steelers for the final time, fans leapt into each other's arms and danced on their chairs. "I can't stop shaking," said Nikki Seitz, 30, of Green Bay, as fans tossed a roll of paper towels in the air behind her. A drained-looking Alison Struve, 28, of DePere, wept when the Packers finally won. "I was so nervous the entire game. I couldn't enjoy it," she said. "When I knew they were going to win it was like a release. I'm just sublimely happy. Just to be surrounded by so many people who care about this team. . . . It's more than a game. It seems bigger than that." Controlled pandemonium ensued on the streets. People leapt into their cars and began cruising up and down the downtown, honking their horns, hanging out their windows and high-fiving anyone they saw on the sidewalks. Hundreds of people jammed the downtown bar district and spilled out onto the street. Women climbed onto men's shoulders, people blew air horns and grown men jumped up and down like children. Green Bay Press-Gazette employees sold extras with a giant headline that read "World Champs." A group of fans hoisted a cardboard replica of the Lombardi trophy over their heads as Griep raced by with her flag and nearly bare torso, turning heads. Kim Smith, 39, and her fiance, Kris Nielsen, 30, of Seymour, stood on the sidewalk smiling, taking it all in. The couple met at a Packers game years ago, making the moment unfolding in front of them even more special. "We cried and we screamed," Smith said. "Just out of control. So nerve-wracking." Hundreds lined the city's bridges over the Fox River as green-and-gold fireworks boomed overhead. Ryan Hatzenbeller, 24, of Green Bay, took off his No. 21 Charles Woodson jersey and waved it at traffic bare-chested. "Dude! It's Green Bay, Wisconsin! We won the Super Bowl! We've got nothing better to do!" he shouted at a reporter over the din. McGahn told special counsel investigators that Mr. Trump called him twice, telling him "Mueller has to go"
"Sunday Morning" correspondent Seth Doane goes behind the scenes with one of the music world's biggest hitmakers, the Korean boy band BTS. In this preview of a report to air on CBS April 21, Kim Nam-joon, a.k.a. RM, talks about the band presenting at this year's Grammys, and their promise to return.